I've always wanted to go to The Walrus & The Carpenter in Seattle. Though it is for slightly morbid reasons - I mean in the Lewis Carroll poem ALL THE OYSTERS DIE. Even in the Disney version of Alice in Wonderland, they all get eaten. And if Disney can't put a cheery spin on this poem, basically no one can. Sorry, oysters. You were delicious. Especially the North Bay ones, which were the unanimous table favorite. We also ordered other dishes to try out cause you can't live on oysters alone. We went 30 minutes before opening to guarantee a seat, as the restaurant is tiny. Overall, the meal was good and the oysters were good but I'm not sure if there were any dishes that I'd die to go back for. The uni profiteroles were fantastic and the table loved them - but would I wait 30 minutes just to eat them again? I'm not sure. They were the special of the day anyways so there's probably no real chance of having them again! However, the place is such an institution that I'd definitely recommend going at least once to check it out. The food won't disappoint! Sorry the above picture isn't the best. I cooked half of the contents of my refrigerator last night so there was absolutely no time to take out the nice camera so I resorted to using my phone camera. Plus my coworkers keep asking me for this recipe (Hi Sona! Hi Judy!) so I need to get this post up ASAP! (2) Buy bone-in, skin-on chicken breasts. Rub with a little olive oil, salt and pepper and bake at 350degrees for about 25 minutes. Remove skin and bone, cut the chicken into pieces. (3) Buy boneless, skinless chicken breasts. Rub with a little olive oil, salt and pepper and cook on the stovetop grill until done. If the pieces are huge like mine were last night, grill for 10 minutes on each side over medium heat and then finish in a 350degree oven for another 10 minutes or so. It's better to grill for skinless/boneless instead of oven roasting because the lack of skin and bone takes away from flavor, which the grill imparts onto the chicken. Confused? Hopefully not. But the above is a great way to get cooked chicken for all recipes - salads, soups, just to have grilled chicken for a healthy dinner, etc. The recipe below is a rift on a Ina Garten recipe but I definitely health-ied it up. Season chicken with salt and pepper (if not cooked yet) and cook. In the meantime, cook the broccoli florets in salted boiling water for about 1.5 minutes, just to get the raw taste out. Drain immediately and either shock in an ice bath or run under cold water for about a minute to keep the bright green color. Mix the ingredients for the dressing together. If you're cooking the chicken to order then pour about 1/3 cup of the dressing while it's still warm, after you've cut it up. The warmness of the chicken will soak up the dressing. 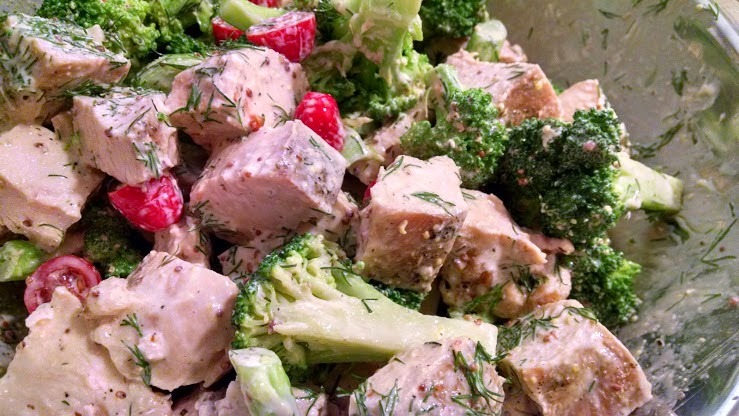 Combine the chicken, broccoli and tomatoes. Mix in the dressing until everything is moistened and the amount of dressing is to your preference. Gently stir in dill or tarragon to taste. Don't skimp, it makes all the difference! Dining at Joël Robuchon is a dream of mine. A pricey dream. But L'Atelier is the cheaper (albeit still on the pricey side) way to experience his cuisine without springing close to $500! I definitely took advantage of this opportunity when my mom and myself were in Vegas on Christmas Day. My dad and brother weren't coming until the next day so I convinced my mom that dining here was a great idea. Win! Most of the space is for counter seating, which is great because you can see the kitchen at work. The interior is super sleek and modern. Very Vegas-feeling. I really liked the pops of red against the black. There are multiple menus to choose from (3 course, 5 course, a la carte) but we decided to go for the Seasonal Discovery Menu. Cause my frugal dad wasn't there to stop us. Now on to the food! The meal ended with tea and I loved the attention to detail given to even that - look at the little printed chocolates that came with out tea! This meal was so amazing, totally lived up to my expectations and everything was executed perfectly. The foie gras ravioli, mashed potatoes, quail and veal hanger were definitely stand outs but I can honestly say that each and every dish was delicious. Can't eat like this every day but on a special occasion - it's worth every penny of the splurge.